Kat Jennings and Scott Murphy don't just play two people who are secretly in love on a television sitcom--they are also head over heels for each other in real life. When the lines between reality and TV land blur, they hope they can keep their relationship under wraps. But when Kat's grandmother, an aging Hollywood starlet with a penchant for wearing elaborate evening gowns from Golden Age movies, mistakes their on-screen wedding proposal for the real deal, things begin to spiral out of their control. Will their secret be front-page news in the tabloids tomorrow? And can their budding romance survive the onslaught of paparazzi, wedding preparations, and misinformed in-laws? From the sound stage to a Beverly Hills mansion to the gleaming Pacific Ocean, Stars Collide takes readers on a roller-coaster tour of Tinseltown, packing both comedic punch and tender emotion. I decided to stay in the present for a change, so this is the first book I've read in a while that wasn't set in the past - or in the future! 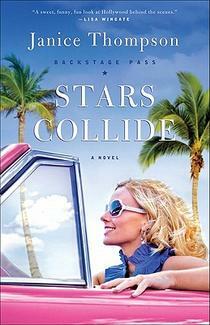 "Stars Collide" is the first book in the Backstage Pass series by Janice Thompson. The second book, "Hello Hollywood" just released this month, and I believe a third book is on it's way. I haven't read Janice Thompson before. I was a little flabergasted at the beginning since right on the first page sit-com stars Kat Jennings and Scott Murphy get together. I thought, "Where can this go?" But I read on, and soon found a whole underlying storying unravelling regarding Kat's grandmother - Lenora, a former Hollywood glamour star. This book made me think of "rom-com" movies - something you might expect to see Katherine Heigl or Jennifer Garner in, except it's clean and Christian! It's a light and entertaining novel, and served it's purpose for me as I was looking for something sweet to read since I just have way too much going on at the moment for anything heavy. It's a feel good kind of book, that includes a little mystery and scandal, and alls well that ends well.